Hello and happy almost Halloween. Halloween has always been a favorite of mine, ever since I was little. We were pretty broke while I was growing up, but my Mom always had fun creating costumes for me out of whatever we had on hand or Goodwill finds. I think that is why I ended up being so creative with my kids. I loved making their costumes and come up with crazy ways to decorate the house. Shoot I have even dressed my dogs up (yes...yes, I am one of those people). I know I have told you that my Mom wasn't much of a cook (love you Mom) but my Grandmother prided herself in a lot of her traditional holiday meals. Well they were our traditional meals, meaning meals she always made for certain holidays. She always made a huge batch of oyster stew for New Years, fresh bread at Easter with the glazed ham, and this was one of my favorites that she made for Halloween. I can remember when I got older I asked her why she called it "Ghoulash" and she said it was because it was frighteningly good! Gotta love Grandma!! But she was right. This is the perfect comfort food. It warms you from the cold October nights (well they were cold in Nevada...and here in Washington too), but it is so good you want to eat bowl after bowl of it! I tried to lighten it up just bit by using ground turkey instead of beef, and just a dollop of low fat sour cream on top instead of stirred in. You could do away with the sour cream altogether but it would be hard for me to have this meal without it. So give this dish a try on Halloween night. Send your kiddos out trick or treating with a nice warm full tummy. That way they won't be tempted to eat the candy while they are out and there will be more for Mom and Dad to scavenge through hehehehe. Looking for more ghoulishly good Halloween foodie fun? How about Devilish Potato Mummies, Goblin Eggs, or a Vampire Kiss Martini? Do you have any traditional Halloween dishes? Saute the ground turkey in a dutch oven, over medium-high heat, until no pink remains. Add the onions and garlic. Stirring occasionally, cook until the onions are translucent, 5 to 7 minutes. Add the chicken stock, diced tomatoes, tomato sauce, paprika, cumin, marjoram, crushed red pepper flake, and bay leaves to the pot. Season with salt and pepper. Stir well. Place a lid on the pot and cook for 20 minutes. Remove the lid and add the elbow macaroni. Replace the lid and cook for an additional 20 minutes. Stirring occasionally to prevent the pasta from sticking to the bottom of the pot. Remove the lid and cook for an additional 10 minutes or until the sauce has thickened up. Top with a dollop of non-fat Greek yogurt and a sprinkle of paprika. Oh boy...I see lots of pounds adding to my body now that I found your blog! YUM! Bookmarked! I am definitely going to make this for my kids this Halloween. My mother couldn't cook either, but I remember her making "Hungarian Goulash" when I was growing up (beef mince,an onion, elbow macaroni and a tin of tomato soup, that was it!) and I loved it. I'm throwing a family party this Halloween (it's not as big here in the UK, we're not likely to get any trick or treaters), but I want my kids to have a feast - this recipe will feature. 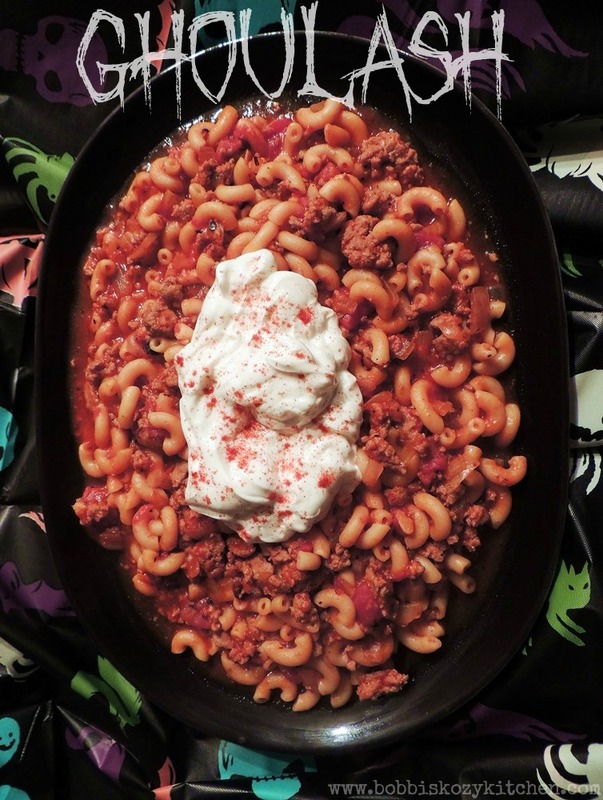 "Ghoulash", I love it! Oh I am so excited!! I really think you will like this. I forgot to add that we put crushed red pepper flake in ours because Kevin and I like some heat.My Grandmother never did that. Hungarian Goulash was the ONLY thing my dad could or would cook. We would seriously have it at least once a week growing up when it was his turn to cook. What a great idea to have it for Halloween. I haven't had this in years. I need to make it for my hubby now that it's getting cold. YUMM! Bobbi, this look so much like my moms. I have to make it this week. Thanks for sharing. This looks super good! We're having super cold trick or treat tonight...and I'm making hot ham sandwiches and chicken and noodles. Thanks for sharing at Must Try Monday! Mmmmm that sounds good!!! Have a great Halloween!! !